I found it about '97, I guess. It was in a little bike shop in Kelowna, British Columbia. Any yellow bike will be sure to catch my eye, but one glance told me that this one was special. I walked over. Sure enough, a Campagnolo crank, and Nuovo Record derailleurs. And -- a triple chainring! 42/45/48 rings with a 14-26 5spd block out back. GB bars and stem. Mafac centerpulls. Stoved enamel paint, hand pin-striping on the lugs and topeyes. Full Reynolds 531, with half-chromed stays and fork. Campy 1010B dropouts and hand-made cable braze-ons. Big, long and tall. In fact, a classic Brit tourer. $250? Sold. I took it apart as soon as I got home. The results were good. There was no visible wear on the drivetrain, and the grease in the hubs and headset was still red outside of the races. The decals were a bit scuffed, the paint not perfect, but hey! The components suggested that the bike had been assembled in the late '60s, and my guess was that Mr. Lipscombe was one of those small framebuilders that set up shop all over the UK after the last war. No amount of Googling turned up evidence to support this theory, but no matter! I knew I had a keeper. The question was: just what place would it fill in my cycling life? The slightly-too-small fit, clunky shifting and total lack of bottlecage braze-ons limited its usefulness as a tourer. 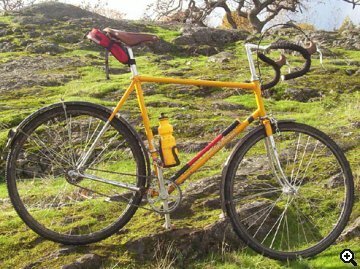 It was too nice to use as a one-speed beater, but the lack of shifter braze-ons and the 120mm rear meant that modernizing the drivetrain was out of the question. I did buy a 40h rim to go with the back hub, but that was a false start. Well, I have been reading 63xc almost from Issue #1. I'd also read Sheldon Brown's persuasive articles on fixed gear, and later gotten addicted to Dennis Bean-Larson's Fixed Gear Gallery. More reading on 63xc.com, especially Matt Chester's articles, and things really started to gel in my mind. It seems Matt has been having an influence on my life generally over the last year. Just in small things. More fruit and vegetables, less crap. Big, roomy bike fit. Pursuing simplicity and inner peace. Spin. Breathe. Etc. Wish I could find the dough for one of his frames. But, for now, I have the Lipscombe. And I have one fun bicycle on my hands. I can't get enough of the feel of that solid gear on the dirt, and the control and balance it gives me when the trails get twisty. The fat tires help me ride places I couldn't on my other bikes, and the lower gearing dissipates any haste I may start out with. It took some time -- two years, in fact -- to gather the parts. The wheels are now 700c, rather than 27 inch, for obvious reasons. The slightly smaller modern size gives me oodles of tire/fender clearance. I built up the new wheels with Ambrosio rims. I forgot the model after I removed the stickers, but they're heavy as lead, bomb-proof, double-walled, grommetted and all-black. Got an old Stumpjumper hub from a MTB buddy, so the front wheel has plenty of good XC mojo. The rear turns on a Surly with 19 and 22t cogs. Straight-gauge spokes/ brass nips. Bonty Jones CX 32c rubber that I scooped for a song. And never for one moment have I regretted over-building these wheels! The cranks could be OEM, but they aren't. They are in fact Campy Stradas, with a 144BCD which restricts me to their original 42t ring. But, with the 22t cog, I get a 51" gear. 'Bout right, I figure. (Matt would approve.) SRAM chain, in 3/32" since I really couldn't see the point of 1/8" and had the ring in the parts bin. I am anticipating taking this bike on longer paved rides eventually, so I can get plenty of versatility by using other wheels. The tall Technomic stem may look a bit goofy, but the extra standover has been a godsend. The stem is less flexy than it looks and, with the steel Nitto 42cm bars, makes for a stiffish front end. The gear seems about right at 42x22. Pretty sedate getting to the trail, but I have way less trouble getting up, over and through stuff than I did on my previous 42x19 setup. The bigger cog also allows better low-speed control and fine-tuning of crank position, there being more pedal rotations per meter travelled. The ride is plush, Rolls Royce, and totally predicable. The long wheelbase and generous fork rake that give the chassis stability also ensure that it's not a stunning climber--but you can't have everything. When I rode it as a gearie, the flex in the main triangle used to bother me. Not any more. I think the flex contributes to the bike's beautiful roughstuff riding characteristics. The burly touring frame takes hard riding very well. It has a plodding, just-get-on-with-it feel, but I can throw it from line to line with relative ease. I am totally stoked over my new ride, and I can truly say that I have not had this much fun on a bike in a long time. Even my $5,000 custom doesn't have this place in my heart. The True North is a different bike, built for different reasons, sure. As a tool for exploration, the Lipscombe fills in any gaps left by the big-dollar custom gearie rig. On a recent weekend I spent three hours out at Uplands Park riding over stuff that I didn't think possible. The rocks were slippery from the rain of the night before, but I was able to clean a lot of really hairy stuff -- hairy to me, that is, given the built-in limitations of the bike, and my general lack of skill and poor sense of balance. On that way to the park and on the way back I did a mud test. The city boys are redoing the sewers on Kings, just this side of Foul Bay Rd. A little park/ vacant lot that I have ridden in before is now a gloryhole of mud and dirt. After a night's rain, the mud, churned up by heavy equipment, was the perfect consistency for a true test. If you ignore the lack of chainstay clearance on either side of the rear tire, this is a mean machine in the slop. One Solid Gear is definitely a plus when things get slippery. The fixed drivetrain gives me a perfect "feel" of the terrain, and the narrow tyres cut through it like nothing. My geared 26" wheeled brethren will not know this sensation, nor the ease of cleaning when getting home. No big-dollar parts to trash! No cables to fill with dirty water and grit! No grinding the back rim down to powder! Technically I am not allowed to ride in Uplands Park, but I haven't yet had the stink-eye from anyone. I've actually made a few friends among the elderly dog-walkers. I make a point of being super polite to all other trail users, dismounting to pass. I also try to live by the mantra "Ride, don't slide!" So far so good. Plus the bike looks like a road bike, so it doesn't scream "I'm ripping moss off rocks!" Living out here in Victoria, British Columbia, a place that even the locals call "more English than England", that definitely helps. I smoke a pipe with English tobacco, and, if I didn't wear a helmet, it would be a tweed cap. Ah, life in the colonies! Oaks and ivy, stone walls and sudden views of the sea... I consider this bike a part of my heritage, too. Colin Williams is a bike-crazy, car-hating Christian Anarchist from Victoria, British Columbia, Canada. His life is a little too much like his gearing sometimes -- single. If you have more info on the Lipscombe, Colin would like a note from you.